Think of your health as the amount of money in your bank account. Just as you’d like to have more money and keep growing, it’s also wise to have more health in your body and keep that growing as well. 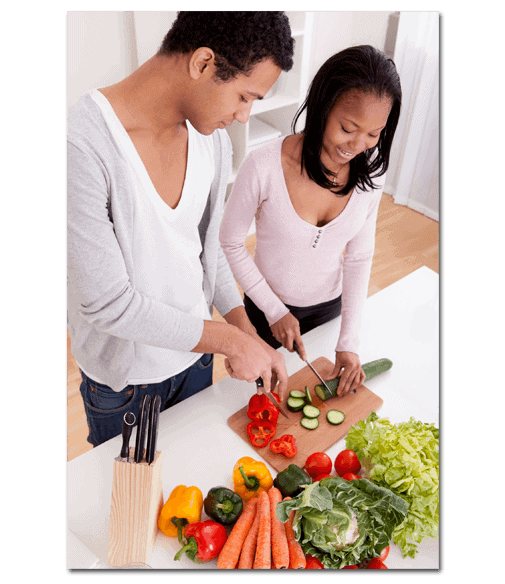 And while maintaining a balanced diet may not always be convenient or cheap, it’ll definitely pay off both in the short and long- term health plan you intend to have for your body. A good trick is to divide your plate. Mentally visualize your plate divided into 4 quarters. One quarter should be protein. The size of your palm is enough. One quarter should be complex carbohydrates, for example brown rice or pasta. The last 2 quarters should be vegetables and some low-sugar fruits. Another good point to keep in mind is the more colorful your plate, the healthier it is for you. Do not eat the same food every day, a varied diet rich in vegetables that are local and in-season, if possible organic, is best. For a quick pick-me-up, the first thing we crave is candy, chocolate, pastries, chips or some French fries. But the truth is those foods contain refined carbs (and unhealthy fats as well as too much regular salt), which even though they may help the brain produce serotonin and dopamine, they also cause a quick crash. Serotonin and dopamine are known as the “feel good” hormones which your brain secretes when you feel great after hitting a milestone or reaching a goal. On the healthy side of the spectrum, a whole-food diet produces a more lasting effect on your mood and helps regulate the levels of hormones and energy in your body. The rule is that food quality is more important than food quantity. Eating moderately sized meals and eating the right foods for your individual body type as well as incorporating movement in your daily life are three ways you can be in control of your weight. Having a healthy weight helps to reduce your risk of chronic diseases, like heart disease and diabetes just to name a couple. Eating foods high in iron and other essential nutrients boosts your energy levels throughout the day. For example, the mineral iron helps carry oxygen throughout the body. Examples of food sources rich in iron are meat, spinach, Swiss chard, almonds and quinoa. Also, snacking on nuts and fruits, and drinking water helps maintain your energy levels. If you think about it in that perspective, you’ll realize that food is much more than just “dieting”, counting calories or reading food labels. It makes us look at food as the sustenance we need to keep going strong for many years to come. Have you experienced chronic fatigue? Then I encourage you to visit our website. DocChristine is a German-trained, conventional as well as naturopathic physician, family doctor, board-certified (Germany) as a dermatologist, allergist, and naturopath. She is now working as a nutritionist and a certified integrative nutrition health coach. Her teammate, Certified Integrative Nutrition Health Coach Jennifer, specializes in guiding you to a well-balanced bio-individual nutrition and helps you to optimize your brain health and general health, lose weight and more. As Integrative Nutrition Health Coaches, we know how to guide people to the right decisions to re-build their health from the ground up. DocChristine is trained in root-cause and bio-individual medicine and can help you find the real causes of your symptoms and give you directions and support to reverse your depression, chronic fatigue and other chronic illnesses, even if you need to continue taking conventional medications and can’t make drastic changes to diet and lifestyle. Previous Post Root-Cause Medicine: 8 Benefits for You Next Post Is it “All in Your Head” – or Something Else? ?